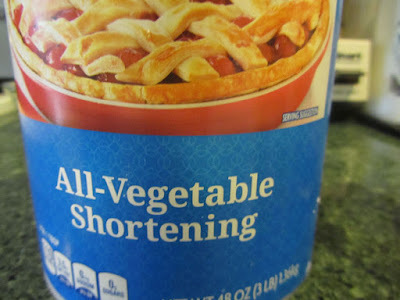 This is not an item that you can use straight out of the pantry, but requires some microwaving. However, sometimes the convenience of a pantry item comes at a cost. Compare the ingredients' list for the commercial product vs. a homemade substitute. A little background for how I came to making my own dipping chocolate, for making chocolates, dipped strawberries, dipped brownie bites and cookies and for use as a homemade "magic shell". I had a great aunt who was a part-time chocolatier. She sold her hand-dipped chocolates every November, to raise money to bring her son home from university on the east coast. My great aunt was a widow, while still raising 3 children. Her son was accepted to a very good school on the east coast, with a scholarship to cover his tuition, supplies and housing. But there was little additional money for my great aunt to bring him home over the holidays, each winter. She had always been a fantastic home-baker. And her hand-dipped chocolates were well-known in their small community in Utah. If you were lucky enough to receive a box of her chocolates at Christmas, you considered yourself very fortunate. In the summer before her son went away to university, my great aunt's circle of friends suggested she take orders for her chocolates, to be delivered in November. She followed their advice. Every year, she was able to raise enough money for train fare home from Connecticut, as well as to buy gifts for the rest of her family. She, of course, used a confectioner's grade of chocolate, called couverture. Couverture is a very high grade of dipping chocolate with at least 32% (and as much as 39%) cocoa butter. It's an extremely creamy, silky, delicious chocolate that has that perfect "snap" when broken or bit into. You can buy it both tempered and untempered. (Tempered will simplify candy-dipping.) My great aunt drove an a hour round trip to buy her chocolate, each fall. When I asked about grocery store ingredients that I could more readily buy, she suggested the bars of chocolate sold in the baking section. Those chocolate bars have more cocoa butter than chocolate chips. Although my great aunt's instructions were for using a tempered chocolate, for dipping hand-formed centers, I have found that I can make a respectable product, using a straight-forward melting with a fat addition. And she used the double boiler for her chocolates. But for homemade confections, to be consumed fairly quickly, I've found the microwave to be a real time-saver. Chocolate chips will work and make a perfectly acceptable product that you're just going to spoon over ice cream or dip strawberries into, and eat immediately. I choose to use Crisco, as I always have a can of it in the pantry for pie pastry, it is flavorless, and it works very well for making dipping chocolate. 4 ounces chocolate chips -- roughly 2/3 cup (semi-sweet). 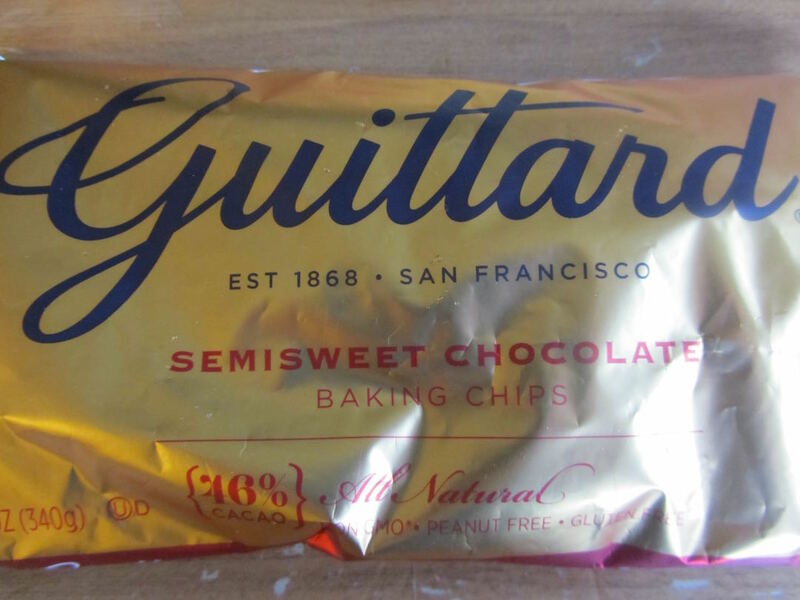 Do not use "chocolate-flavored" baking chips. They don't seem to melt as well, perhaps less or no cocoa butter. The better quality chocolate you use, the smoother your chocolate dip will be. Milk chocolate chips, peanut butter chips, mint chips, vanilla chips or butterscotch chips may also be used, but they have a higher sugar content and therefore scorch more readily. To avoid scorching, use 1 tablespoon of fat per 4 ounces of chips, and microwave only on 20 to 30% power. After the first 2 melting intervals, reduce microwave time to 20 seconds, each. Much care needs to be taken with these other chips, to melt slowly in the microwave. Melting chocolate slowly will give you the smoothest dipping chocolate. It could take 3 minutes or so, depending on quantity. It's important to melt chocolate slowly and evenly. If using a bar or chunk of chocolate, break it into 1/2-inch or smaller pieces. A glass container will absorb the heat from the chocolate, and keep the chocolate stable. In an absolutely bone dry, microwaveable, glass container, place the chocolate chips or chunks, and fat. Melt in the microwave on the LOW to MED (30 to 50% power, or DEFROST) setting for 30 seconds. This first melting will basically just melt or partially melt the fat, and not the chocolate. Remove and stir the fat into the chips/chunks. Microwave again, on LOW (about 20 to 30% power), for 30 seconds, then stir. Repeat this about 3 more times (or until the chocolate is almost melted). Stir between each melting, scraping down sides. Chocolate pieces that are indeed melted can retain their original shape. You will only know if the chocolate is not quite melted by finding lumps which do not stir out. When the product is near-completely melted (but not all the way), remove from the microwave and stir for about 30 seconds. This final stirring will incorporate any small amounts of semi-solid chocolate. 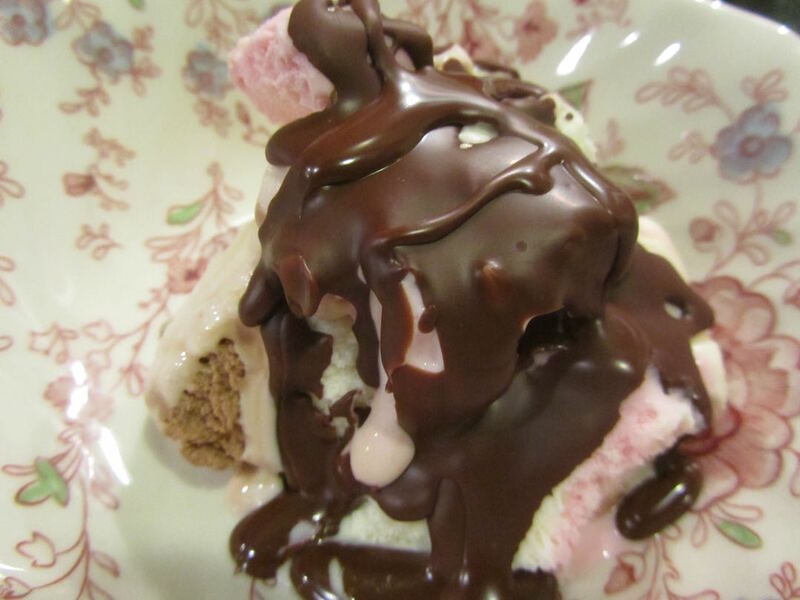 If you would like a thinner stream of melted chocolate and softer consistency, stir in an additional 1/2 to 1 teaspoon of Crisco (this is better for ice cream topping, than for dipping candies, strawberries or cookies, as it is slightly softer). Microwave at full power for about 8-9 final seconds. Stir. Drizzle immediately over bowls of ice cream. It will firm up in about 30-60 seconds, depending on thickness. Reduce or increase the quantity of both ingredients, as needed to make more or less, but keep the proportions of chocolate to fat. Also, if you reduce the amount being made at any one time, remember that it will melt much more quickly than a larger amount. 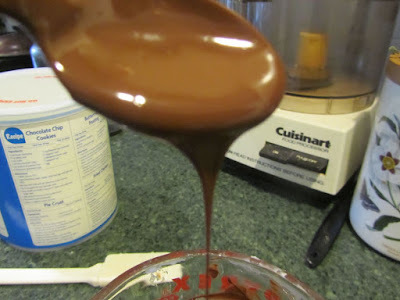 Melting chocolate is not the same as tempering chocolate, but works fine enough for homemade confections. Without tempering the chocolate, your final product is susceptible to fat bloom (the powdery white film that develops on chocolate, over time). Fat bloom takes a few days to appear, so this dipping chocolate is best for items that will be consumed soon. Leftovers can be saved and reused. Melt at full power in 10 to 12 second bursts, stirring well, in between, scraping down sides of container. Do this a coupe of times, until thin and drizzle-able. For a really gourmet, chocolate-aficionado treat, use bar chocolate, sold in the baking section of the grocery store. These chocolate bars have a higher concentration of cocoa butter than chocolate chips and melt more smoothly and are creamier in taste and texture. So, using chocolate chips, bought on sale for $1.99/12 oz package (66 cents for 4 oz), and 2 teaspoons of shortening (estimate at less than 5 cents), 4 ounces of homemade "magic shell" costs about 70 cents. The name brand of self-hardening, chocolate ice cream coating sells for $2.00 for 7.25 oz., costing about $1.10 for 4 ounces. Hmmm, what would I rather eat, the less expensive, mostly chocolate version (the homemade one), or the more expensive, but less chocolate tasting, store-bought version? I did buy it once, as a novelty thing. Then when I turned the container over and saw that it was just coconut oil and sunflower oil that made it liquid in warm temps, but solid over ice cream, I thought what a waste of money. My family has been soooo happy with the homemade version. We were talking the other night how delicious homemade ice cream sandwiches dipped in melted chocolate, would be. It would be like homemade Eskimo Pies or Klondike Bars but better! Those would be soooo good. I'm thinking mint ice cream, between 2 chocolate cookies, then dipped in melted chocolate! 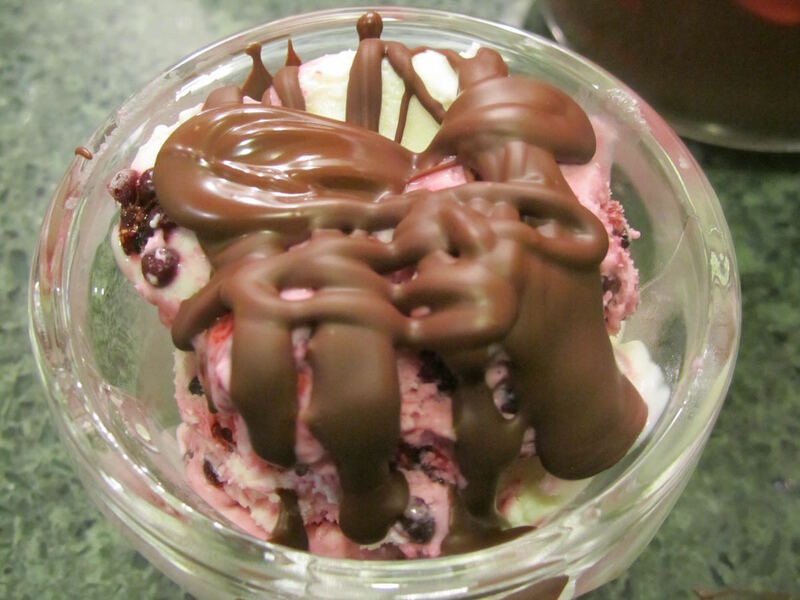 Thank you for your recipe and step by step instructions...my husband would definitely want me to make some of this, as he is always buying chocolate syrup in the bottle to pour over ice cream. I wasn't aware of Magic Shell sold in the supermarkets either. This weekend, I microwaved some Werther's caramel (the baking chunks) in some "butter" and it turned out smooth and syrupy, then hardened pretty quickly. I was trying to add the caramel chunks to a slow cooker Apple Betty that I had started and didn't know how to incorporate the caramel chunks so I thought of the microwave. The microwave is certainly a time saver and miracle worker. My DIL makes delicious mochi in the microwave and told me how easy and inexpensive it is to make. So recently, I tried making it with a red bean paste filling and I can't tell the difference between the mochi we buy ready made from the shops. So easy to make, just mix a few ingredients and microwave for 10 minutes. In the old days, our grandparents pounded mochi rice for hours to make New Years Day mochi cakes. Then I recall my aunt buying a mochi maker (similar to a bread maker), but the texture and taste was not quite right. The microwave cooked mochi tastes much better and no different than the commercially sold cakes. For about $3-4 I made 24 mochi cakes, about 1/4 the cost of storebought. it's always a hit here. It does sound like something your husband would enjoy. I saw mochi in the the store for the first time today. One daughter was asking what it was made from, and I said, I think rice. I'll have to look up some recipes to get a better idea of what it is. In the store where we saw it, I think it was over $4 for about 6 to 8 pieces. Basically this is the recipe, I also added 1 T. vanilla (or other liquid flavoring or lemon juice). Instead of the canned sweeet red bean paste, I bought the less expensive ones sold in plastic bags, approximately the same weight as the canned. To portion the red bean paste, I simply snip the corner of the bag and use like a pastry bag, squeeze/cut 12 portions of red bean paste on a pan and pop in the freezer until the mochi cools and the "an" (red bean paste) can be wrapped. After 10 minutes in the microwave, the mochi is sooo hot, helps to have someone hold the bowl as you spoon out (TGF silicone spatulas) the mochi onto the floured cutting board. I make two batches to use up all the red bean paste (cost under $2 at our local supermarkets). I individually freeze what we cannot eat that day, so we can have mochi whenever we have the craving. I wrote down some other fillings to try: Nutrella spread (or cookie butter), sugar coated strawberry pieces, single scoop of ice cream, apricot jam...(don't remember the site that gave these ideas) Hope you try it one day, because it is sooo easy to make and freeze ahead. As you can see, I'm busily trying to figure how to cut out stores as much as possible from my life, keeping to basic ingredients. Another discovery I came across was this microwave chip maker (As seen on TV), purchased for $4 at our local thrift store, practically brand new in the box, and it really works. So now I don't have to buy chips either. Just one potato sliced on the mandolin yielded a bag of chips. We tried some basil topping on the chips and it was like eating a potato cracker. Instead of canned red bean paste, I buy the plastic bagged ones because they are usually a buck cheaper, plus I like the convenience of using it like a pastry bag. I googled and found the identical brand and package sold at Amazon, but the price is insane: $35.00 + $10.89 shipping for 6 bags. That comes to $7.50 per bag when I paid only $1.89 locally, regular price. Some stores may charge a little of $2, but not $7.50. But this is the red bean paste, use Koshi An or Tsubushi An. I prefer Koshi An because the filling is smoother. OK...my last comment since I think I exceeded my per guest limit lol...I'm on an Apple Betty fix, since discovering I could use odd pieces of breads in our freezer and apples discounted as damaged from our grocery stores. With just a few simple ingredients (what seems like discards really) and a slow cooker, we can have apple dessert without the trouble of baking or buying an apple pie. Since reading your blog, I've taken a bit more interest in serving desserts at home. It makes a difference, as we look forward to dessert at the end of the meal. Thank you for that information on mochi. I'll check out that link. We enjoy having dessert, here. It doesn't have to be fancy, but can even be fresh fruit with a drizzle of jam or some whipped cream. I'm with you, dessert makes home cooked meals seem special. And most of the time, when making something at home, I can make something relatively healthy. That Apple Betty sounds very delicious, and easy! I prefer bar chocolate to chocolate chips. Chips are formulated to hold their shape when baked (in other words NOT MELT) so chocolate bars give a smoother texture. I agree, bar chocolate is so much smoother and creamier. It's what my great aunt suggested, if I was just going to use supermarket ingredients. All this talk about chocolate, today I was in a shop that sold couverture. I didn't price it, as I was in too big of a hurry. I have bought it locally and if I remember correctly it is about 16 bucks a block. I think the block is over a pound, 22 ounces maybe? I love it but I do not like the tempering process. Can't wait to try your idea. The couverture I saw yesterday was in small disks. I didn't pay attention to the amount in a bag or price. Next time I'm in that direction, I'll check it out. I've also seen it sold online. Most of the time, it's simply out of my price range, but for making hand-dipped chocolates as gifts, it could be worth the expense. That's pretty neat that you got to learn about chocolates from you professional aunt. I don't usually have any hard fats on hand like Crisco or coconut oil, so I may try butter and take my chances. I don't need it to be as good for pouring on ice cream as one would dipping. I use butter instead of coconut oil for ours, (it's mainly a taste thing) but I make just enough for us to eat with the ice cream, so there is rarely any left. If there actually is a bit leftover it gets warmed and eaten within a day or two, so I don't worry about the bloom. I have always tempered chocolate for dipping but I will definitely try the coconut oil version for Christmas candies this year. Live and learn, if it does seize up, try "fixing" it with vegetable oil. I know a bit of vegetable oil will smooth out slightly overcooked melted chocolate. Great recipe! I've been meaning to try making magic shell for a while and this looks really simple. My great-aunt used to make buckeyes and peanut butter eggs at easter. She used paraffin, too. On a slightly different note--can I tell you how impressed I am with how you manage your pantry/food stores? I am cleaning out my own pantry and freezer today and while I have certainly gotten better over time, I still found myself having to toss a few packages of things that went (very) stale or were freezer burnt. Thank you for the inspiration! how lovely that your great aunt made those confections. I'm not sure I've ever had a buckeye. I'll have to look those up and see what they are! Good luck with your freezer and pantry clean-out! I just bought my first gallon of ice cream this summer! What! I'm not an ice cream lover and we're on a tight budget that buying ice cream is a big treat and one that is not purchased very often. I bought some cheap root beer and that will be the only summer treat this year. When it's gone, we're done. There is some old chocolate syrup in the refrigerator and maybe even some caramel that we used once for ice cream but I'm not sure if that is still any good. oh root beer floats! Those sound refreshing, and I'm sure will be very appreciated by all!. I hope you all enjoy this treat tremendously! I love the family history in this blog post - how interesting! I'm glad you found it interesting. I miss that great aunt, very much, and have such wonderful memories of her.